Dura-foam padded camera compartment is fully customizable for your SLR or Camcorder system, with adjustable and removable padded dividers. Holds a complete digital and film SLR or video camera system with a full range of lenses, flashes, filters, and a tripod. Fully protected computer pocket holds laptops with up to a 15.4″ screen and provides easy access without disturbing photo gear. Front mounter tripod attachment system and two detachable cases that provide quick assess to cell phones, mps players, light meters, or GPS systems. 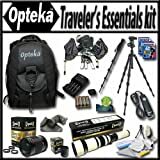 Package includes: Opteka CS-200 Cyber Backpack (Black), 650-1300mm Extreme Zoom lens, 500mm Telephoto lenses with 2x Duplicator, FTR56 54-Inch Heavy Duty Tripod, M900 71-Inch Heavy Duty Monopod, 2 8GB SD memory cards, Large Rain & Elements Cover, 1x-2.5x Right Angle view finder, Remote Shutter Release Cord, 4 AA batteries and travel charger, Triple Axis Bubble level, Camera and Lens Cleaning kit.